Officially, qualifying comes with a 60% chance of rain, but the late forecast suggests that conditions will be drying throughout. Regardless, it's a huge contrast to yesterday's session and will force all the teams to do more than a bit of guessing with regards to cooling and set up, though notably with Mercedes slower than Ferrari on the straits, at least yesterday, it was possible they were running a higher DF configuration to compensate for the wetter weather that is supposed to dominate the weekend. Ferrari corporate politics was also a hot topic in the paddock, with Sergio Marchionne missing a meeting of Fiat-Chrysler bigwigs due to his recovery from shoulder surgery, where he might be outed as Chairman or CEO or whatever it is that he actually does (technically he is both for Ferrari), according to Reuters. Having not been seen in public since June, it is thought that medical issues are forcing him to step down earlier than planned. 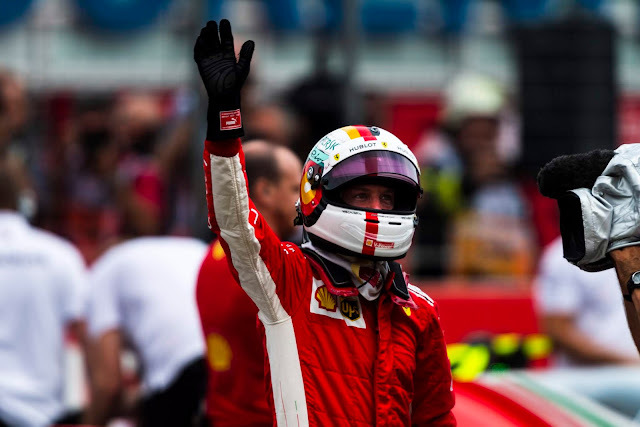 Johann Elkann, one of the Agnelli brood, supposedly set to replace him as chairman at Ferrari with Louis Camilleri, current board member, stepping into the CEO role, but what that will do to current plans to bring Leclerc to Ferrari next year, and Ferrari in general, remains to be seen. Also unclear is whether or not Marchionne's role at FCA is under discussion at this meeting. On race pace, not much to choose from between Mercedes and Ferrari looking at FP2, with HAAS the best of the rest, but since the track was nearly 50°C those times will not be representative for the rest of the weekend, unless the sun comes out and the track warms considerably. Happily, that will be good news for Red Bull, who put on a fairly strong showing yesterday, as unpredictability will decidedly play into their hands. Ricciardo is taking a slew of penalties for taking upgrades in advance of Hungary and will start at the back for this week's GP. Given the relative ease of overtaking at Hockenheim, and after looking at Hamilton's showstopper in Silverstone, it might very well be a better strategy to burn through an extra engine and take a penalty at a friendly track, rather than manage pace to make the 3 PU's last the full season, a strategy suggested last week by SomersF1 as potentially part of the performance advantage Ferrari was suddenly showing over Mercedes. Let me reiterate: PART of the advantage. Green Light!! Sirotkin out on the Ultras, then Stroll and Leclerc, officially a dry track despite the utter deluge earlier in the day. 16 minutes and Sirotkin was off (no, not THAT kind), bettered immediately through the first sector by his teammate, with Leclerc just off by a tenth. AS the Williams completed their flying laps, the rest of the field was rolling out of the pitlane, waiting for track conditions to improve. A mistake by Stroll in the middle sector ruined his first effort, and it was Leclerc to the top, early in the fight for the midfield, with a 1:15.203. And then, in rapid succession both the Force Indias and HAAS cars rocketed past, with Grosjean into the 13's and both HAAS outpointing the FI lads. Alonso took P4, then Sainz went P3 as Hulkenberg went to the top, a tenth up on RoGro. Leclerc, on his second effort was back to the top, with 11 minutes left on the clock as Raikkonen was onto his first hot lap, the track evolving rapidly as fresh rubber was laid down on the rainwashed track. Ferrari and Mercedes both were out on the Ultras, with Q2 the place to look for alternate tyre strategies. Vettel at the top with 1:12.765 followed Raikkonen as Mercedes were out on their first effort. Bottas was nowhere near the pace of his teammate, and finished 0.3 seconds down on Lewis, who went P3 with a 1:13.012, leaving just Red Bull to toss their hat into the ring. As they got down to business, both Vettel and Raikkonen were having another go, and both improved their times, without changing places. Ricciardo slotted into P7, not really concerned with going fast due to his grid penalties, and Verstappen went P5, yesterday's session toppers nought but a happy memory for the Milton Keynes outfit. Vandoorne had reported gearshift issues but the big shocker was Sainz, lingering in P16 while his teammate was P6. After Sainz, it was Hartley, Stroll, Sirotkin and Vandoorne all on the outside looking in with 4 minutes left in the session. Raikkonen had gone even faster and managed to go to the top, with a 1:12.505 as those with it all to lose were on their outlaps and getting ready to have one more go at making Q2. Leclerc to P6, and Sirotkin to P13, with Stroll struggling nearly a half second off his teammate's pace. Hulkenberg was still in the pits, with under 2 minutes left and it was Renault making the bet on saving tyres. Grosjean to P4, ahead of Hamilton now as Lewis continued to circle the track like a shark, waiting to make its move. Perez, Stroll, Vandoorne, Sainz, and Hartley all in danger as the last seconds ticked off the clock, with Ocon on the bubble as the checquers fell. Hartley up to P16 as HAmilton reports his gears are not changing. Sainz next up, went P10 putting Ocon out. Ocon to P14 as neither Vandoorne nor Stroll improved. That's Lewis Hamilton's qualifying session over! BOOM!! Hamilton radioed in a loss of throttle and his race engineer told him to shut it down. Arguing desperately, he tried to keep it going but the team insisted. Into neutral he went, and out of the car to try and push it round, but the marshals took hold of it and his day was done!!! P14 would be the best he could do (thanks to the Ricciardo penalty) and a measurable dent in his championship hopes as a total loss of hydraulics did him in. With several offs over the kerbs, including a high speed one at T1, speculation was that that this had caused the damage to the hydraulic system that shut his bid down. Vandoorne, Stroll, Hartley, Gasly and Ocon were also all done, off in search of some spaetzle, but it was the high drama at Mercedes that stole all attention as the rest turned it around for Q2. Grosjean led the way into Q2, with HAAS and Leclerc all sporting the Ultras. Red Bull confirmed that Ricciardo would not be running and first Grosjean, then Magnussen seized the top of the leaderboard, with a 1:12.523. Bottas rocked up to a 1:12.152 and it was Verstappen with the alternate tyre, running the Soft. Alonso, too, liked the yellow banded tyre and it just remained for Ferrari to show its hand as the clock crossed the ten minute mark. Ericsson then put it into the gravel T13, fortunately not beached, back onto the track and limping it back to the pits. Both the Ferraris then emerged onto the track with the Ultras affixed, as Max's time with the Softs was good for P7 only. A shot of the apex of T13 showed that Ericsson had dragged rather a lot of kitty litter onto the track, which Hulkenberg sliced neatly past (it was offline-ish) to go P6 as the red flag was thrown at 6:57. This rather spoiled Sainz' first lap, ruining Renault's strategy of setting their laps during the lull while the majority of the field were in the pits. Sainz, Ericsson and Sirotkin were the drivers up against the wall (all with no time) with Raikkonen and Vettel behind Bottas after their first run, albeit with the gravel that wasn't present for Bottas' run. It rapidly emerged that the session had been stopped in order to clear Ericsson's mess from the track. This being Germany, it wasn't enough to send out some marshals with push brooms out, instead, a massive streetsweeper was dispatched which slowly cleaned the majority of the gravel from the track. Of course, as anyone who has ever witnessed one of these machines in operation will know, some of the gravel was spat out to either side, meaning that marshals with push brooms wound up on track anyway. An impressively inefficient operation indeed. With the session re-opened, Kmag was making the argument that HAAS didn't need to run again and it would be be better to save tyres for 2 proper runs in Q3. The track had climbed to 40FC and off went Ericsson with 5 minutes left to go (no, not that kind). Red Bull chucked Verstappen out, on the Ultras this time, which given the fact he was in P9 seemed to be a reasonable precaution. Wide at T12 for Ericsson, but still P10 and pushing Alonso out of the cool kids group. P2 for Verstappen, just off Bottas' time. Alsonso, Sirotkin and Sainz were still out and it was Sirotkin first to hit the line. Personal best in S1 for all 3 drivers, with Sirotkin the slowest of that gang. P10 for Sirotkin, then P11 for Alonso. Leclerc, running to protect his spot went P8 and his teammate, having been demoted could only manage a P13. Sainz, after having his first run stopped short, pulled off a respectable P9 to make Q3. It was a big gap from Hulkenberg to the HAAS, though, with nearly 0.4 seconds putting the American team, which had announced it's intention to skip the next test due to budget considerations, into a bubble all of its own. Going no further were Alonso, Sirotkin, Ericsson, Hamilton and Ricciardo, natch, off in search of a Heffeweissen to quench their thirst. Sirotkin was just a tenth off Alonso's time, which is perhaps the first ray of sunshine for the team from Grove, as they brought a bucket of fixes, including a new front wing, for their woes, some of which were apparently working well enough. This is better news than it seems as it means their issues are not correlation ones, but rather, erm, design issues shall we say. Raikkonen led the way onto the track for Q3, followed by Vettel. Bottas was not far behind as the top of the charts claimed early possession of the circuit. Verstappen trailed out about 20 seconds later and Sainz was the first of the midfielders to emerge, shadowed by both HAAS drivers, RoGro leading and Hulkenberg behind. Leclerc was out just as Raikkonen was on it and he manged to emerge between the 2 Ferrari drivers. Purple for Vettel S1, Kimi purple S2 and then Vettel claimed S3 as his own, going P1 with a 1:11.539 as Raikkonen had made a mistake in T12, costing him several tenths. Bottas split the two, dropping Kimi to P3 and Verstappen a lonely P4 0.4 seconds off Raikkonen. Grosjean took honours from Magnussen on the penultimate run and the 0.3 seconds between them was the perfect size for Hulkenberg to park his Renault in. Sainz, on a pair of used Ultras, was P9, just behind Leclerc and Perez didn't bother, saving his fresh tyres for a sole run at the end of the session. Last runs kicked off with Raikkonen and just under 3 minutes to go, but behind him was a tightly bunched pack: Perez, Grosjean, Magnussen, Bottas, Hulkenberg, Sainz, Leclerc and Vettel, dead last. Bad news for Bottas as the closeness of Magnussen was going to make getting his tyres properly prepared a tricky issue indeed. Raikkonen was well on his on his last lap as the jockeying behind him intensified. In fact, Kimi was busy purpling S3 as Vettel was just crushing S1. Raikkonen was up to P2 and behind him it was Bottas, eclipsing the Finn and gaining provisional pole with Vettel still on it. As Mercedes erupted with astonishment, Vettel had found another gear, taking S2 purple as well. AT the end of it, Mercedes would still own S3, but not by nearly enough to make up for the first 2 sectors and thus it was Vettel, cruising into pole position by 0.204 seconds, followed by Bottas and Raikkonen. Verstappen went P4, but with a much more respectable 1:11.547 this time, about three tenths back of Kimi.